Do you really know what you’re putting on your hair? Many hair dyes you can buy in the shops or hairdresser contain toxic chemicals that can cause skin problems or even increase the chances of DNA mutations (a potential cause of cancer). As a result (and to save money), many people are turning to supposed natural alternatives, with the internet showcasing a plethora of home-made and plant-based concoctions. Yet very few of these provide much evidence that they colour hair. My colleagues and I recently conducted research to see if ultrasound, which is used to encourage fabrics to absorb dyes, could also help natural hair colours to be more effective. But while the results were positive, we also found that the treatment – and some of the natural dyes themselves – can also cause hair damage. Hair dyes work by filling strands of hair with coloured chemicals, which enter through the hair’s pores. In permanent dyes, two types of molecule go through these holes and then react to form a bigger type of molecule that is too large to come out again. Semi-permanent dyes, meanwhile, only penetrate the outer layers of the hair and use chemicals that like to stick to the keratin protein in hair. In both cases, alkaline solutions such as ammonia can help to swell the hair, open up the hair cuticles and widen the pores to improve penetration and enhance the colour. A huge range of natural products are recommended online for covering grey hairs, creating highlights or even changing the entire hair colour. Suggested substances include coffee, tea, beetroot, carrots, onion skins, nigella seeds and a tasty concoction of vinegar and soy sauce. Since these are all things we eat, they are inherently non-toxic, but most articles that recommend them suggest reapplying every week or fortnight and provide little evidence they actually work. A common suggestion for highlighting is to use lemon juice, honey and sunlight. The sun’s ultraviolet rays damage hair melanin which results in a yellowed colour, and the small amount of citric acid in lemon juice can speed up this reaction. But the acid can also shrink the shaft of each strand, leaving hair thinner, and strips the hair of essential oils and moisture. You can also buy hair dyes that use naturally derived ingredients. If you don’t mind having purple hair, one natural ingredient that has been shown to work is blackcurrant extract. However, the most common ingredients in natural dyes are henna or indigo, with henna’s use dating back to the ancient Egyptians. When mixed with indigo, henna can create a range of shades from brown to black. These colour extracts work in a similar manner to temporary dyes and are adsorbed onto the surface of the hair. But like other plant-based dyes, henna treatments are limited by their messiness and the need to frequently reapply them. To see if we could improve the hair dyeing properties of natural hair dyes, my colleagues and I recently tested the effects of ultrasound on samples of goat hair. Much to the relief of the university ethics review board, this didn’t involve taking a goat to the local hairdresser. Samples of light-coloured goat hair provide a consistent source for testing and it has similar properties to human hair. We already know that ultrasound can improve the performance of natural dyes on wool, silk and cotton. It creates a pressure wave in liquids that grows and collapses tiny bubbles, creating microturbulence that, depending on the ultrasound’s characteristics, can help the liquid’s molecules move around faster. Under certain conditions, ultrasound can also open up the pores of natural materials. Our results showed that, with the right settings, ultrasound could halve the typical two-hour dyeing time of henna-based dyes. But we also took magnified images of the hair using a scanning electron microscope before and after different treatments. These showed that, when ultrasound was applied for long enough, it changed the hair structure, creating a different shape hair follicle that has previously been seen in ectodermal dysplasia patients. In some cases, there was also some surface damage to the hair, most likely from erosion caused by the ultrasonic bubbles collapsing near or on the hair surface. 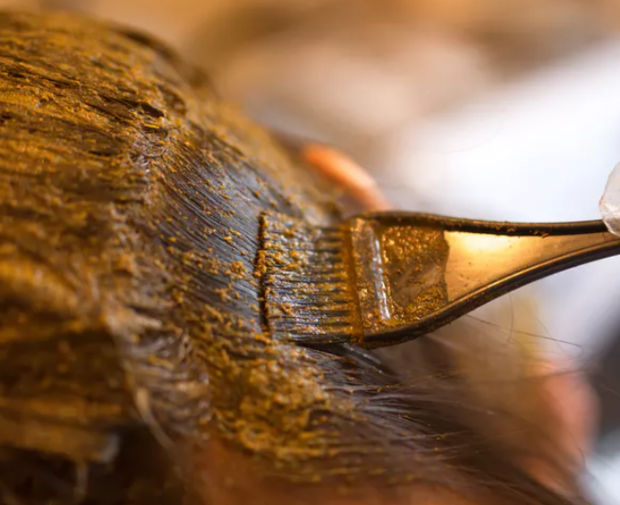 The images also showed that henna-based dye can damage the outer layer or cuticle of hair, which is typically linked to dry and damaged hair. Overall, ultrasound under the right conditions was able to create a more intense colour that was more resistant to washing than using the henna dye on its own, and without damaging the hair. But before you go sticking your head in an ultrasonic bath, we need to work out all safety implications. Our next step will be to look at how ultrasound can be used in the best way to enhance different dyeing formulations without damaging hair and how this can be used in the real world. So far, it doesn’t look like there are any natural hair dyes without their downsides. But there is definitely room for new products that don’t involve smearing smelly, sticky food into your hair.